NLS-EM3070 series embedded 2D barcode scan engines, armed with the Newland patented , a computerized image recognition system, bring about a new era of 2D barcode scan engines. The NLS-EM3070s’ 2D barcode decoder chip ingeniously blends technology and advanced chip design & manufacturing, which significantly simplifies application design and delivers superior performance and solid reliability with low power consumption. The NLS-EM3070s support all mainstream 1D and standard 2D barcode symbologies (e.g., PDF417, QR Code M1/M2/Micro and Data Matrix) as well as GS1-DataBarTM(RSS) (Limited/Stacked/Expanded versions). This compact, lightweight engine fits easily into even the most space-constrained equipments such as data collectors, meter readers, ticket validators and PDAs. 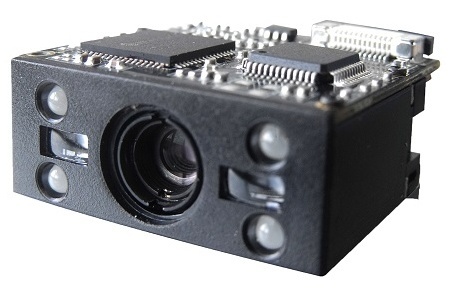 Newland OEM Modules, 2D Modules Based on Processor Decoder, 2D CMOS scan engine - with a flexible cable, TTL232/USB interface. (Based on Newland Decoder Chip, reads 1D & PDF / Data matrix / QR).